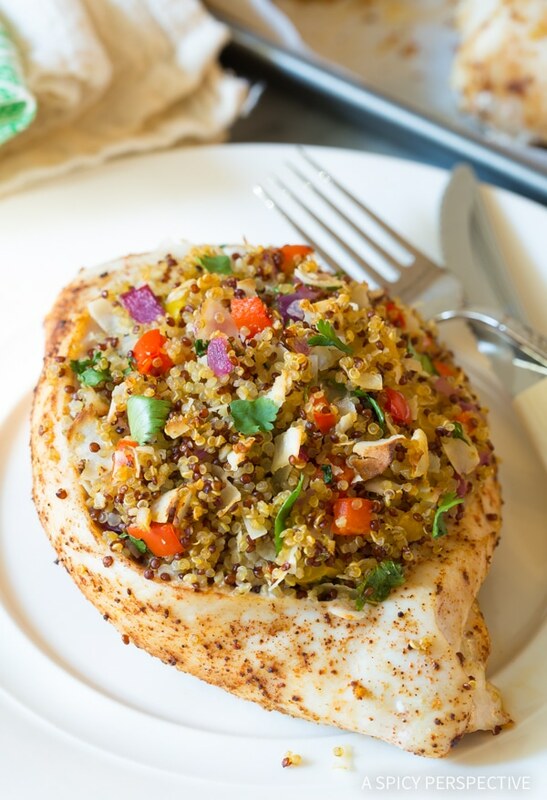 Bright and zesty Confetti Quinoa Stuffed Chicken, a healthy dinner with tons of wow factor! One thing I’ve learned in the last seven years of sharing recipes online, is that you guys love chicken recipes. I guess it’s no wonder. Chicken is affordable, low in fat, and high in protein. 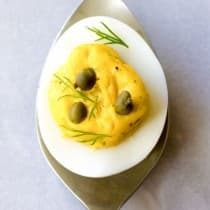 It is a fabulous platform ingredient that easily adapts to every ethnic flavor profile in the world. 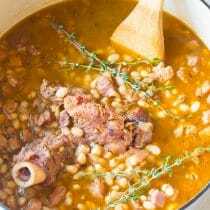 When I plan our meals for the week, I usually include one beef or pork recipes, one seafood recipe, sometimes a vegetarian meal, and two or three chicken recipes. I’m guessing you do the same. 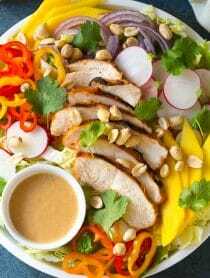 Today’s chicken recipe is a marvelous healthy meal for spring and summer. Our Confetti Quinoa Stuffed Chicken is made with boneless chicken breasts, fluffy quinoa, colorful veggies, serrano peppers, lime, and coconut. 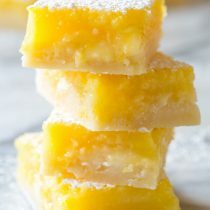 It’s vibrant in taste and appearance, yet is easy on the hips! 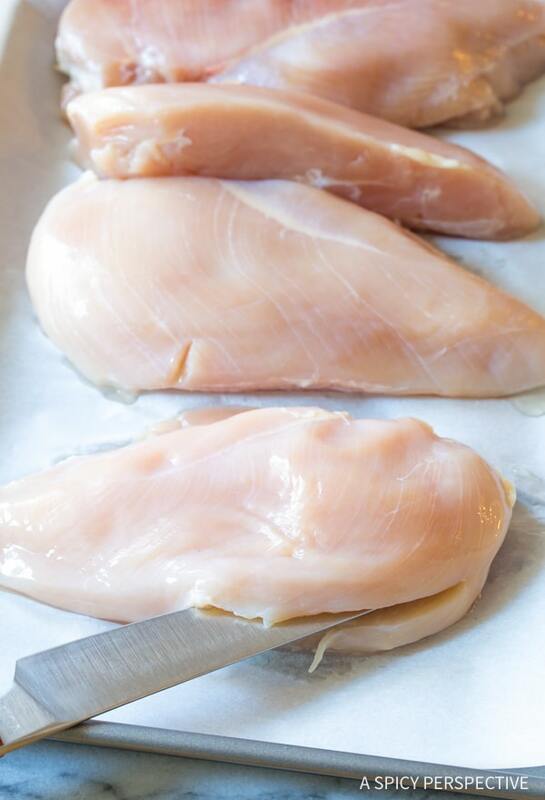 Start by cutting deep pockets in chicken breasts. Make sure to cut them evenly, leaving a 1/2 inch rim around three sides to create a pocket. 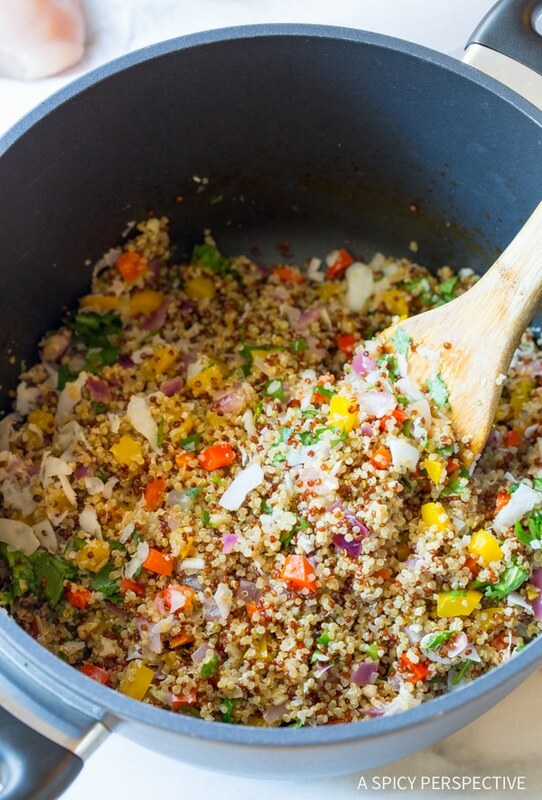 Then cook the quinoa until fluffy and add in all the confetti ingredients. The combination of peppers, onions, garlic, spice, lime and coconut offers a bold island appeal the makes the quinoa especially delicious. 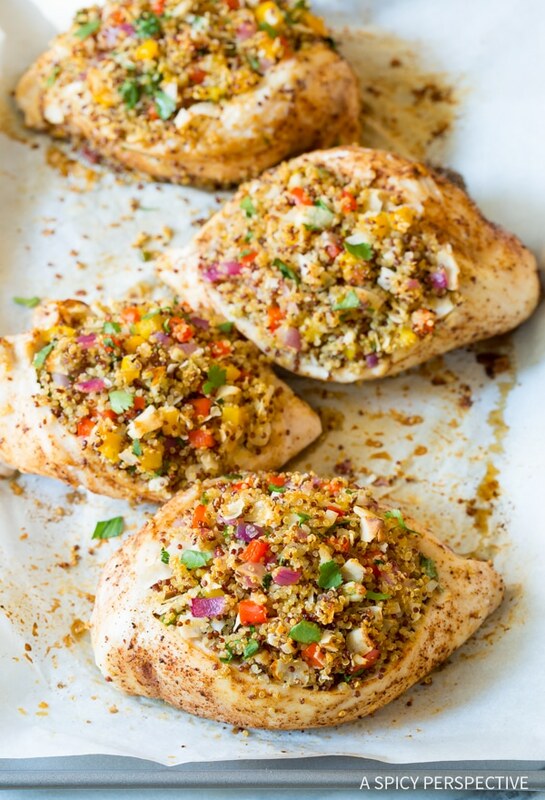 Stuff the confetti quinoa into the pockets in the chicken breasts and bake! 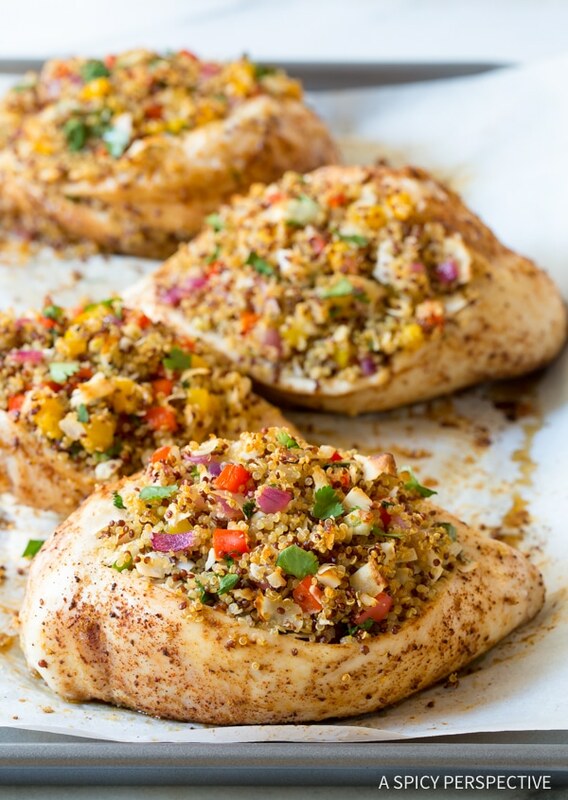 Confetti Quinoa Stuffed Chicken is a lively way to serve your protein and side dish all in one. Just throw in a fresh salad and you have a complete meal perfect for any night of the week. 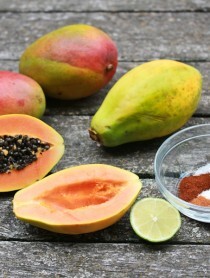 Looking For More Island Inspired Recipes? 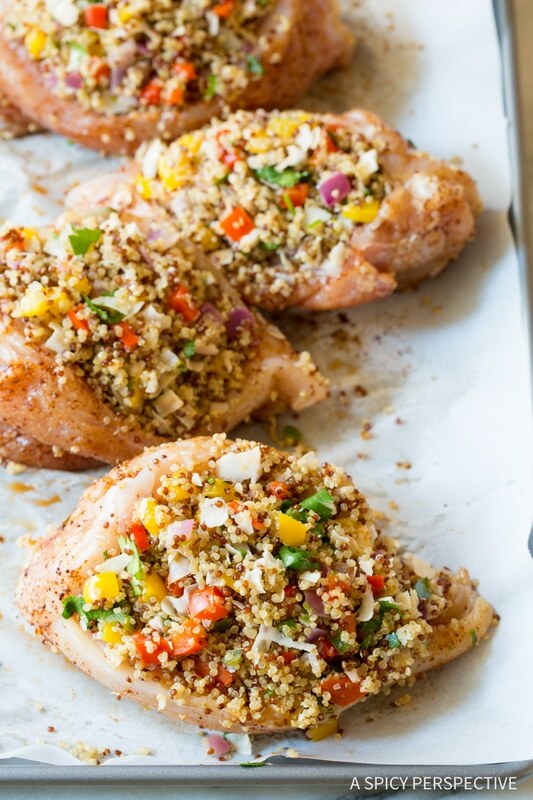 Healthy Confetti Quinoa Stuffed Chicken Recipe - A light whole foods dinner using boneless skinless chicken, packed with vibrant flavor! 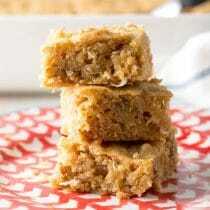 Preheat the oven to 375 degrees F. Line a rimmed baking sheet with parchment paper. 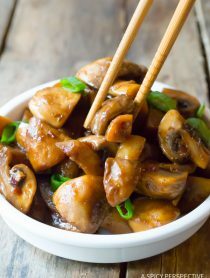 Place the coconut oil in a medium sauce pot and set over medium-high heat. Once melted, add the diced bell pepper, red onion, garlic, and serrano pepper. Sauté for 1-2 minutes to soften just a little. Then pour the vegetables into a bowl. They should still be bright in color. Place the quinoa in the empty sauce pot. Turn the heat up to high and add the broth and 1/2 teaspoon salt. Cover the pot and bring to a boil. Cook for 15 minutes, or until the broth has absorbed and there are vent holes in the surface of the quinoa. 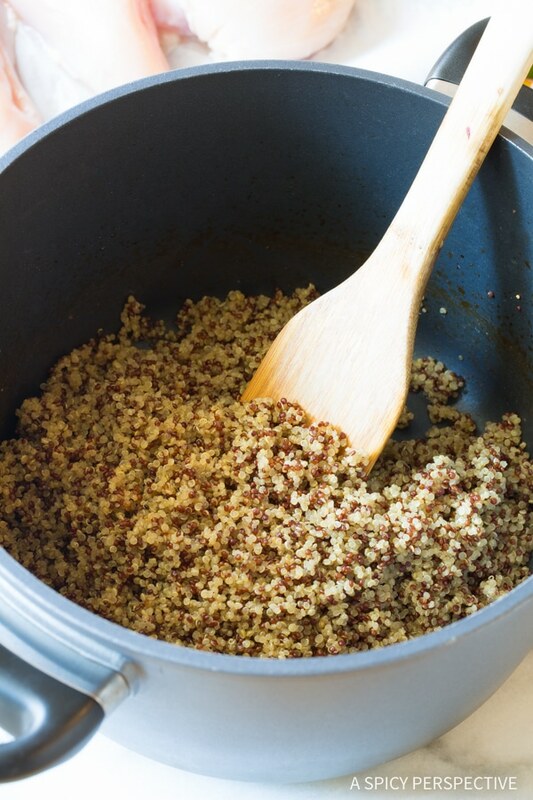 Remove from heat and let the quinoa steam for another 5 minutes. Meanwhile, use a boning knife to cut a slit in each chicken breast along one long side. Cut through the center of the chicken, with the knife parallel to the cutting board, leaving the opposite side attached. You're trying to create a deep pocket in each breast, with a 1/2-inch border around the three attached sides. (See post images for clarification.) Cut evenly, as to not leave thick uncut sections that won't cook through in the oven. Then sprinkle each breast on all sides with cumin, chili powder, and salt. 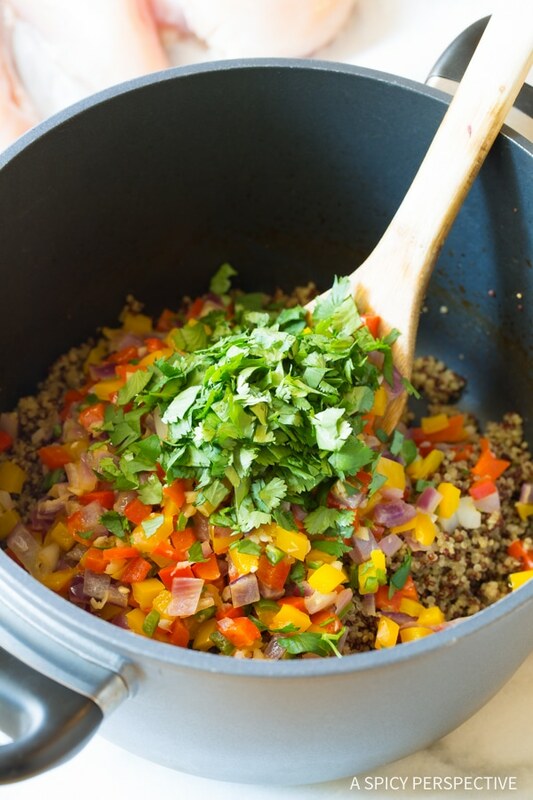 Once the quinoa is fluffy, stir in the sautéed vegetables, shaved coconut, cilantro, lime zest, and lime juice. Taste, and salt as needed. Stuff the confetti quinoa into the cavity of each chicken breast. Stand the chicken breasts up on the baking sheet, like open envelopes, with the quinoa on top. NOTE: Confetti Quinoa Stuffed Chicken makes a great leftover. My kids love to take half a stuffed breast in their lunch box. They say it tastes great at room temperature. I made this for my sister in law and we both love it! The chicken is like it’s own little serving bowl. I love this idea! What great weeknight dinner! This is a perfect idea for week dinner: healthy and creative ! Thank you so much ! That quinoa stuffing looks good enough to eat on its own!